My choice for the first Devon Record Club was an obvious one; so obvious I thought about resisting it and picking something else instead. But sometimes your first instinct is also your best instinct, so I’ve decided to stick with it. 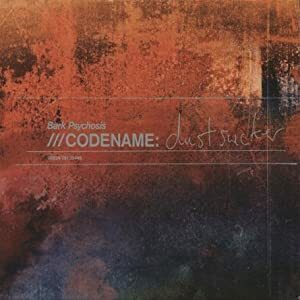 ///Codename:Dustsucker by Bark Psychosis was released in 2004; despite being only the band’s second album, it came out a full decade after their debut, Hex. In the space of that decade, the band had disintegrated from being a four-piece to a one-piece, becoming essentially the solo project of frontman and studio-mastermind Graham Sutton. Music journalist Simon Reynolds infamously coined the term “postrock” in his review of BP’s debut for Mojo, positing it as being the next evolutionary step for rock, encompassing influences from dance, jazz, the avant-garde, and modern digital recording techniques. ///Codename:Dustsucker continues that evolution, drawing from Sutton’s time spent making drum n bass records under the Boymerang name and his burgeoning career as a producer of other people’s music. Sutton spent five years making //Codename:Dustsucker, micro-editing it, re-recording sections, playing with the sound until he was happy with it. I interviewed him around its release and he said the making of music was far more important to him than what happens afterwards, and compared himself to Mark E Smith; except instead of always working and perpetually releasing something new every year, Sutton was just always working on the same thing. Just over a year ago I reunited a load of the writers from Stylus Magazine, where I used to write, so we could put together our top albums of the last decade. //Codename:Dustsucker was the record I put at number one on my own ballot paper. It’s not something I listen to with great frequency; there’s an intensity and density to it that doesn’t require regular revisiting. But it’s a record I listen to in depth when I do play it, and a record that rewards that depth of attention. So what does it sound like, what does it do? //Codename:Dustsucker is a very urban record, a very isolated record, a very dour record, but also a very beautiful and a very exciting record. It takes in the pseudo-freeform structures we recognise as postrock, but applies a far broader palette of aesthetics: you’ll hear touches of jazz, acid house, dub, and sheets of noise, plus oblique references to Chris Morris, lyrics in German, studio accidents preserved in aspic, the drummer from Talk Talk, a sample of a b-side by Bark Psychosis’ earlier incarnation, huge, squelching 303s, guitar, piano, bass, drums, “found trumpet”, and “indicators”. The usual. Rob listened: I know what a touchstone this is for Nick so it was good to sit down and listen properly. It certainly sounds impressive, although when you’ve spent a year tinkering with a drum fill, I suspect it’s time you, or your records, got out more. I can hear the through-line from Talk Talk to Four Tet taking in the sounds of some of my favourite bands of the last 20 years. It’s to ///Codename: Dustsucker’s credit that it’s almost impossible to discern where it is the antecedent and where the descendant. Perhaps, as Nick might have us believe, it’s actually the motherlode. And hey! I’ve got that Boymerang record! I have read through your blog and must say it’s a nice idea, even if I am not currently so interested in ascribing language symbols to music. More intriguing than who likes what is the idea of the record club as a social project. It’s obviously of importance to your group and a great way for you to spend an evening — in good company listening to music. Few enough do that any more. I wonder how this changes the music itself, given that most pop is listened to and enjoyed in isolation in the twenty-first century. Pop seems designed for solipsism. And maybe no better example than this Bark Psychosis record, which creates a space so obviously at one with the recording studio itself — a fractured digital virtualised recording studio at that. The fact that this mirrors the urban landscape (as we have come to recognise it) only makes it a better record, a record for its time. It might sound a little tired in ten years, just as, it must be said, “Hex” sounds a little tired (or is it the countless playbacks?). But while “Codename Dustsucker” (named after a Hoover?) has a certain fractured melange we hear as a cityscape, it quite obviously takes place all inside one head. This is why the little voice samples are so appropriate. Isn’t that the dude’s mother calling him down from the bedroom for dinner? It’s hilarious and invasive, not what you expect from cocoon music at all. These irruptions elevate this particular portrait of the hyper-real above those which wallow in “ambiance”, a term that can hardly be used any more without an accompanying facial tick. But, oh dear, I am writing about music. One final note, then. You guys must have had a pact to avoid Scott Walker, because otherwise I can find no explanation for the omission of “Tilt” or “Drift”. Likewise the complete absence of Miles Davis, Luc Ferrari, Thomas Koner, Iannis Xenakis, and David Toop (not to mention Corsican chant, Bulgarian folk-song, Indonesian Gamelon, Hindustani raga or some juju music) must mean that there was some further prescriptive constraints. Or maybe you guys simply like guitars. Thanks for sharing, as they say.